As you know, Facebook announced last week the rollout of Timeline for Brands. We have scoured the internet and really feel that Mashable has some of the best tips and know-how, so we wanted to share them with you. We’d love to know what you think about this new change for Facebook. Recommendation: For marketers, this major change means that the three above-fold tab apps need to be considered carefully — this will be one of the first things users see when interacting with your brand on Facebook. Brands will want to switch up which tabs are visible “above the fold,” according to current company objectives or project popularity. A good Page analytics tool will be useful for determining which tab to promote on a day-to-day basis. What’s new: With the new Timeline Page format, you will no longer be able to set a default landing Page, a favored feature for many savvy brands. The option was one of the primary ways to control the first (branded) impression a user encountered. Since there are no more tab Pages, there is no way to set one as a default. This will drastically change user impressions when they first visit a brand’s Timeline Page. Recommendation: You will need to apply new and careful attention to all the top messages in the Timeline, as they will be the first objects seen by visiting users. Likewise, Facebook ads for brands will become ever important, as ads will be one of the major ways brands on Facebook can control a user’s experience. Setting up an advertising campaign for a Facebook promotion or new application will be the only way to guide new and clicking users directly to that application (as landing on this Page cannot be achieved by default). What’s new: One major new feature that marketers will love is the ability to “pin” certain posts to the top of the Timeline. Similar to marking a blog post “sticky,” so that it remains at the top of a blog for a specified period of time, pinning a post to the top of Timeline allows it to precede any other content. A pinned post is distinguished by a small, orange flag. Brands can pin only one item at a time, and the pinned item then exists in two locations — as the top item on the Timeline itself, as well as within its chronological place. Once unpinned (which happens automatically when a new item gets pinned, or the item has been pinned for more than seven days), the post remains in the chronology of Timeline posts, but there is no visual history that it was pinned in the past. Recommendation: Since you can no longer create a default landing Page, pinning items to the top of the Timeline will become every marketer’s go-to strategy for highlighting new and interesting content. We will begin to see savvy brands design posts specifically to be pinned, whether images, a well-designed call-to-action, a statement about brand value, or a message calling for the user to click one of the tab panels under the cover photo. What’s new: Finally, brands will be able to send and receive private messages with users. This allows for much deeper consumer interaction, and will also enable Page managers to take extended customer inquiries off the Timeline and into a private message. Recommendation: Be mindful of noise in the Timeline. Since the real estate allocated to each post depends on how engaging it is or how much interaction it has received, it can be easy to clutter your Timeline with customer inquiries. When these inquiries can be better serviced in a more one-on-one manner, reach out to the consumer with a private message and resolve her question. It’s a good opportunity to yield both a happy user and a clean Timeline. Will you or your company do anything differently, right off the bat? Share your thoughts in the comments below. Dating back to 1878, Manchester United can use Timeline to honor its rich history. This photo shows the club’s league championship from 1908. Here, Manchester United leverages Timeline’s strong visual elements by starring a specific current post, making it appear twice as wide. Coldplay’s Timeline cover photo hints at the wealth of potential the new format holds for bands and other performers. Ben & Jerry’s cover photo further illustrates Timeline’s potential to make a strong first impression on Page visitors. Ben & Jerry’s timeline itself showcases the new brand platform’s strong visual elements. Here, Ben & Jerry’s uses the new format to call out an important company milestone — its introduction of several new flavors in 1999. When you visit a Page, you see how many of your friends have liked the company, as well as friends’ relevant public posts. Here, Ben & Jerry’s serves as an example. in the row of apps below the cover photo. ESPN’s cover photo is an intriguing shot from the set of its iconic Sportscenter show. Livestrong starred this post that provides resources for people under emotional duress as a result of cancer. Starring it calls extra attention to the post by making it twice as wide as others. Organizations similar to Livestrong can highlight specific milestones, such as the opening of new services. This post celebrates the debut of Livestrong’s Cancer Navigation Center. Turn your Facebook profile into a video – how awesome is that. Found this awesome new app on Mashable on how to turn your Facebook profile photo into a video. This was an inevitable evolution. Are you going to try it? Let us know if you do! Enter FlipYourProfile, a new Facebook app slash browser plugin that allows you to replace your profile photo with a video. That’s right. You no longer have to have a boring still image in your profile photo box. You can have a moving, breathing, sound-generating profile video on loop. The app was built by Cisco and DDB Singapore as a way of promoting the former’s line of Flip video cameras. The application has two catches: First, only those who have the plugin installed will be able to see your video, otherwise they’ll just see your regular Facebook profile photo. Thus, if you want your friends to see your new profile video, you’ll need to persuade them to install it (and perhaps upload a video to their own profiles as well). Secondly, an ad saying, “Amazing! You can post videos on your Facebook profile. Get the app to view my profile vid,” will be automatically posted to your wall should you decide to upload a video. Still interested? Follow these four steps to upload your own Facebook profile video. Go to facebook.com/FlipSG and download the browser plugin for Chrome, Safari, Firefox or IE. Connect your profile with the app. *Note: If you’re using, for example, your iPhone to shoot video, you’ll need to use a free file converter like Get Miro to convert your .mov file to one of the compatible formats. You should also shoot your video in horizontal mode; otherwise, it will appear sideways on your profile. Interesting post today from Mashable. 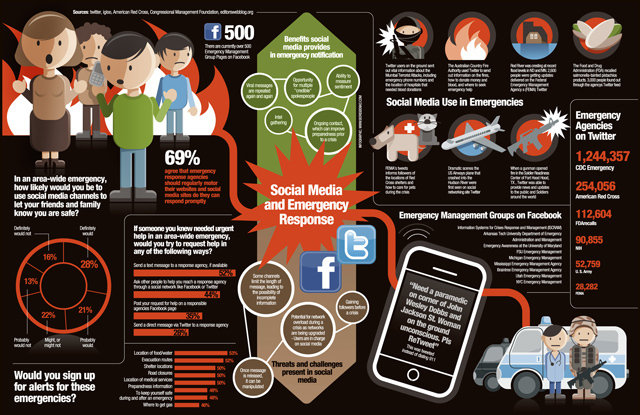 According to the Red Cross more than half of folks would use Facebook to notify their friends and loved ones that they were ok during a natural emergency. Is Facebook your go-to notification device? Let us know what you think. In 2009, two girls trapped in a storm water drain used Facebook to ask for help rather than calling emergency services from their mobile phones. At the time, authorities were concerned about the girls’ seemingly counterintuitive action.